Now you'll wish you were the Easter Bunny, just so you can carry one of these darling little baskets on your back. 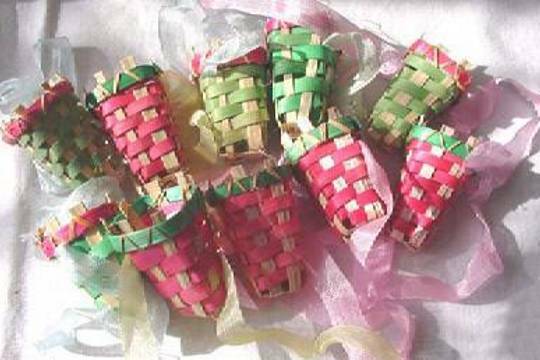 In fact, these little wooden woven baskets were made to be carried by bunny statues and candy containers in the 1930s. The basket measures between 1-3/4 and 1-5/8 inches high and is tapered, with the larger end (about 1 inch in diameter) open on top - ready for you to fill with chenille goodies, or even the real thing - wrapped candy! Each of these sweet woven wood baskets has a lovely silken ribbon woven through the upper staves to hold the little basket on its bunny! The baskets and ribbons vary slightly due to age.